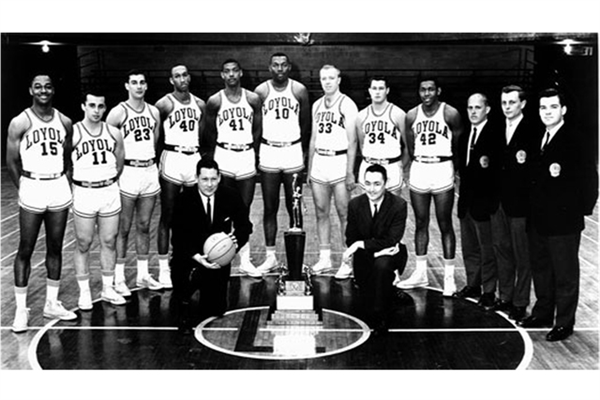 CHICAGO (CBS) – Members of Loyola University’s 1963 national champion basketball team will meet President Barack Obama in the Oval Office, 50 years after they helped break down racial barriers. On their way to the title, they faced Mississippi State in the semifinals, after that team had to sneak away in the middle of the night, because Mississippi Gov. Ross Barnett, a staunch segregationist, wanted to prevent them from playing against an integrated team. The Mississippi State Maroons and Loyola Ramblers ended up playing at Michigan State’s stadium. Their matchup with Mississipi State came to be known as “The Game of Change,” and paved the way for Texas Western’s historic win over Kentucky in 1966, when Texas Western was the first team to start five black players. Texas Western beat Kentucky’s all-white team for the 1966 NCAA title. Though not perfect, maybe America really IS basically a good and moral nation. We reflect on this ground breaking basketball team and, though it's not generally politically correct to do so, we celebrate how far we've come.